32, Jalan Selatan 3, Taman Perindustrian Ringan Pulai, 81300 Skudai, Johor, Malaysia. 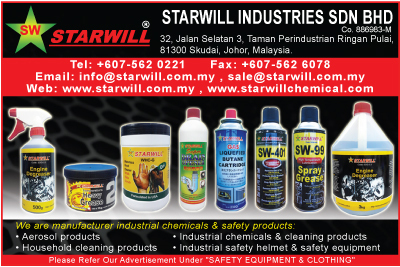 Established since 1992, Starwill Industries Sdn. Bhd. (formerly known as Anglo Sino Enterprise Sdn. Bhd.) specialises in the development, manufacturing and marketing of high quality industrial specialty chemicals for a broad range of dedicated markets. For the past 15 years, the company manufactured and supplied a wide range of industrial chemical products to a cross section of manufacturing, maintenance, marine and many related industries by using the brand name of STARWILL. These activities have catalysed business growth not only in our domestic markets, but internationally such as Singapore, Indonesia, Brunei, Sri Lanka, The Philippines etc. Today, more than 100 over industrial chemical products are in production, such as aerosol type of chemicals including well known STARWILL SW-401 Anti Rust Spray, SW-99 Spray Grease and other industrial cleaners, grease, automotive lubricants for industrial solution. Driven by relentless pursuit and emphasis of product quality and safety, various chemical products were tested and complied according to the standard of Restriction of Hazardous Substances Directive (RoHS). In 2008, the company has diversified in continuing research and development (R&D) by setting up a new division for Personal Protective Equipment (PPE). 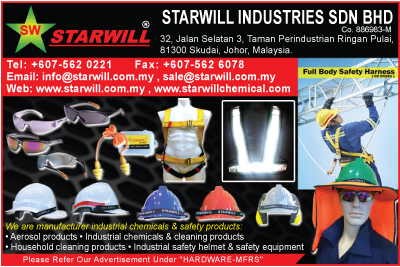 As soon as 2 years time, STARWILL seriously introduced changes and new ideas for industrial safety helmet in Malaysia. The innovation and dedicated process in design and manufacturing has made STARWILL successfully launched 3 models of industrial safety helmet in this shortest period for people who are looking for quality, stylish and designated PPE for head protection. The helmets were approved and certified by the Standard and Industrial Research Institute of Malaysia (SIRIM) for Malaysian Standard MS183.